This is my first post and I have to say I really appreciate this website and the knowledge contained within! Many dedicated beekeepers making it easy for someone like myself, just starting off with my first hive, to get the insight needed to be successful, as well as the benefit of years of experience shared here! I'm building my first hive shortly, and currently working out lumber dimensions in an attempt to make lumber affordable. I'm working off Phil's guide for lengths, and have converted the metric measurements(unfortunately in Canada lumber mills still stick to imperial). My question relates to the wood dimensions. I was quoted almost $400 for Western Red Cedar when I requested 12" wide boards for the body, so I've changed all the widths to 4" to lower costs. What I'm wondering is will I run in to any problems gluing 4" width boards together for the hive body frame, and the roof ends that call for 12" and 8" wide lumber. Would someone who has taken this route of smaller lumber to build their hive have any insight or tips in to correctly gluing boards? Any specific glues I should look for? Are there any other materials used to attach them together aside from glue and reinforcing straps on the body lengths? I can't help you with the glueing advice, I am still new to all this but I understand that wide boards are preferable because they reduce the area available for wax moths to hide. That said, the bees seem to propolise every nook and cranny anyway and there are a few people making hives out of re-cycled pallet wood and not reporting any problems. We used Local Cedar and it cost 45 Euro for each hive, that was two 5 foot long boards for the sides, 1 inch thick, a couple of end pieces and a couple of thin pieces for the roof. The rest of the hive and the deep floor is made with scrap wood. Our local sawmill has dry cedar for bee-keepers and I guess there is enough old trees here that need felling to make the wood affordable, But I am shocked at your quote of 400$. I wonder is there any other wood that is local to you or that could be re-cycled to make it more affordable? I definitely recommend a viewing window on a first hive. Sorry no help, Welcome all the same! I build ALL my TBHs from small planks - usually pallets. 2. 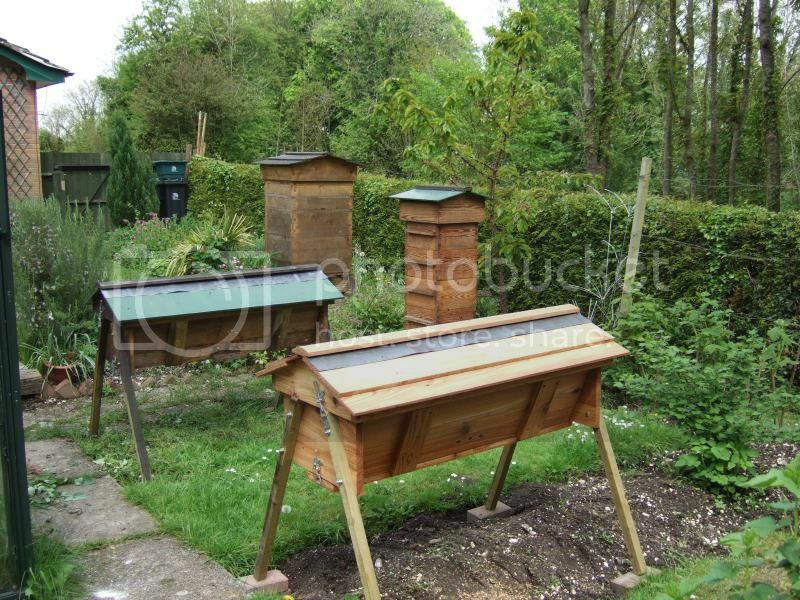 Ensure you have a level surface to work on.. and use verticals at the ends to ensure no movements...(these can be fixed to the end boards and make a more rigid hive). 3. I use Polyurethane glue.. which expands and fills gaps.. BUT you MUST wear gloves when using it and it is very messy when half dry: I use 5 minute PU glue - but it takes a long time - hours to reach full strength.. Gorilla glue is excellent. Glueing depends a lot on you wood working possibilities. If you can creat a smooth plane contact surface you can use white wood glue ( waterproof one ). If not you can go madasafish´s way. With 4 inch boards you can intergrate a 4 inch wide window and spare some wood. You don´t have to use red cedar. I use mostly local larch, which can be very resistant, it has been used a lot on traditional wooden boats. Just as well as douglas fir. Good quality pine is also fine. Then i first looked to build my hive i went to the timber yard and was stunned at how much cedar cost. I then went and found a timber yard where they actually cut the trees to planks etc. I then got exactly what i wanted. The price then dropped dramatically and i have since built a Perone and three Warre hives and three kenyan top bars to Phils design (ta). Last i bought some it was £60 for 6 planks 3.6 m long by 9 inches wide by 26mm thick ( I know, i mix my metric and imperial) I was happy with that price. I have used pva glue to make the sides up for the ktb and have had no issues. I just make sure that, prior to gluing the inner side is as flat as possible to make the use of the follower boards easier. (although even if the follower boards do not fit too well don't worry just have strips of wood you can lay along the edge to seal it and stop the bees creeping out) I then use two support boards on the outside. I do this to prevent any warping and it seems to work and i like the look of it. Best of luck with it all. Piecing smaller dimension wood together is fine but I don't use glue. All the jointed wood is with shiplap joints held secure with braces. If you decide to make any design changes you won't be able to as easily or to change out a board that has rotted over time. I like playing with wood and thought it would be good to use "good" wood. Compared it to pine and the price difference is dramatic. Ended up using pine which is finished with either white paint or beeswax and linseed oil and they have lasted years. My point is that making a box is easy so why make it expensive? P.S. But jointing narrow strips does work, I do this if I don't have any timber the right width. SOP. Thank you very much for all the advise! Apparently my local lumber mill only buys wood when he can get it at a discount, and sounds like most of the lumber there will be pricey. My local home hardware has deck building lumber that sounds promising. It is Western Red Cedar, and measures a full 1" width and 5 1/2" wide. It comes in 10' up to 16' lengths, and the 10' pieces are only $13 plus tax. I suppose my only option will be to go check out the boards, and shop around to find what I can. If I use the 5 1/2" lumber for my hive I could either glue 2 widths together and modify the plan to accommodate an 11" body instead of 12", or I can cut 3 boards to 4" to get the right width, and then use the 1 1/2" leftover to make my top bars and other various odd lengths. Is it a sound plan to buy lumber like this and just cut it to my required dimensions? It depends on the look you want. If it is a fine decoration for your yard the lumber anywhere can get expensive. If you are building a home for bees there is rough cut garden bed lumber available at affordable prices from independent garden centers. I can get rough cut 2x12x10' pieces for $13.00 US. It takes a bit more work to mark out and cut, you get some waste but the price is less than 1/2 of what quality red cedar costs here in the north west US. The side panels are continuous boards, glued together with Elmer's. (A white-glue brand common in the US.) I briefly thought of doweling them together, but never did. The wood, of course, was already thoroughly dry and weathered, so I simply clamped them for a day or so. Wood screws from the end boards hold the whole thing together. The only dimensions that I paid close attention to was the slope of the sides and the height of the box. (The side profile, in other words, matches the plans.) One is painted (latex paint); most are not. The hives are sitting on cement blocks, shimmed with wood boards so that they are level in both directions. (This seems to be important.) There's something "distinctively different" about each one, as a vague nod to helping the bees find their way home.(?) "There, uhhh, are no legs!" Each hive is treated, outside-only, with one coat of Thompson's Water Seal. (The lid is treated on both sides.) Nothing on the bars, follower-boards, or insides. To assure a supply of water in our Northwest Georgia (USA) summer doldrums, I have a large metal chicken-waterer, with large rounded rocks set in the trough so that the bees can land on them to drink the water. The rocks greatly reduce evaporation, also. So ... my entire setup is "nothing to look at." No, it will never win awards in shop class. However, the only expense that I actually had in building it was to buy the metal handles and a quart of Water Seal. (Since I live very close to one of the more-obnoxious beekeeping-supplies distributors in this part of the States, I take perverse pleasure in this ...) And the bees are perfectly happy to live there and to give me the small amount of honey each season that I choose to take from them. Honey, to me, isn't "a crop." It's a delicious gift of nature, and different every year.